Pahan Tharuwa, meaning in Sinhala ‘Ray of Hope’ is an annual MJF Foundation event which brings children from distant parts of Sri Lanka together, for a ‘day of joy’. The first Pahan Tharuwa was held in 2001 to bring happiness to the lives of the children of Sri Lanka’s 20 year conflict. That year over 500 children from close to the ‘front line’ participated. 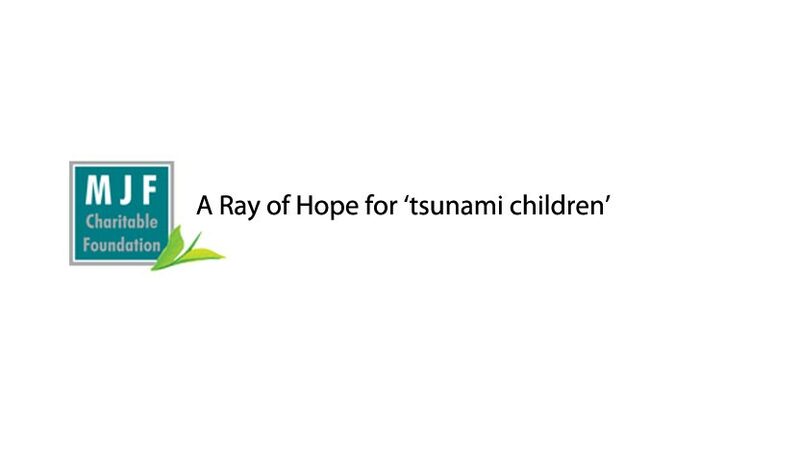 In 2005, Pahan Tharuwa brings joy to the children of another disaster – the tsunami. Spanning two days on September 1st and 2nd, the event brings over a thousand children from refugee camps and devastated homes in Sri Lanka’s South, together to play, and enjoy themselves, many for the first time since December 2004. The concept of Pahan Tharuwa evolved from the knowledge that children must play. For normal psychological, social and general development, children need to interact with other children and experience care, fun and exhilaration. For many of Sri Lanka’s children it is not so, for their circumstances often cause them to lose their childhood entirely. Children in the North of Sri Lanka whose families underwent fear and enormous deprivation during the 20 year conflict that raged in that area, participated in the first Pahan Tharuwa event. They grin with happy memories to this day, 4 years later, when asked about their ‘day of joy’. That is the significance of the impact of one day, that most children would consider a normal day of play, on these children who have so little. Children who attended Pahan Tharuwa this year were from 17 refugee camps and urban slums in the south of Sri Lanka. They were collected and brought to Colombo with some parents and care givers. A fleet of buses transported over 500 children from some of the worst affected areas of the south, including Galle. Many were coming to Colombo for the first time in their lives. The children enjoyed breakfast, lunch and dinner, they were entertained by one of Sri Lanka’s best known musicians – Anil Bharathy – and they had unrestricted access to all the rides in Colombo’s Sathutu Uyana. Each child received a gift of an outdoor game or educational toy at the end of the day and were transported back to their camps after an exhilarating day. Most of the children present had experienced the tsunami themselves, many having lost several members of their immediate family. Since that day, the destruction and dislocation caused to their families, schools and infrastructure in the area meant that the children had even less to smile about than they did previously. Most are forced to work as soon as they can walk with some steadiness, even if it is to care for their homes, sweep, clean and draw water etc. This is a dilemma that every poor parent feels for their desire for something better for their children must be tempered with the reality of their survival. Merrill J. Fernando. Settler of the MJF Foundation, welcomed the children and was joined by his grandson Amrit in making them comfortable. The event was funded by the MJF Charitable Foundation, and in the same manner as all MJF Foundation projects, handled personally by one of the Fernando family. Merrill’s daughter in law Serena headed a team of volunteers from the Dilmah companies in organizing the two day event which brought light into the hearts of so many children. The MJF Foundation is currently managing over 50 tsunami relief projects for social and economic rehabilitation of the victims of tsunami in the south and east of Sri Lanka. These include the construction of houses, schools, community centres, replacement of boats, nets, engines, grants to rebuild lives, vocational training, medical and food aid. The work of the MJF Foundation is made possible by consumers, distributors and retailers who support Dilmah Tea.